From left, Dr. Octavian Adam, Dr. Mohamad Khaled, and Paul and Kathie Schafer discuss the results of Paul’s recent DBS treatment at a recent press conference. Paul Schafer’s wife likens it to “something out of Star Wars,” but it’s firmly in the realm of real-world science, and it holds the potential to change countless lives. 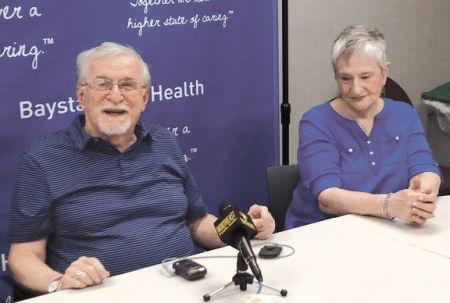 It’s called deep brain stimulation, and for Schafer, who suffers from essential tremor, as well as many Parkinson’s disease patients, this treatment — now available at Baystate Medical Center — has opened a door to enjoying the activities of daily life most people take for granted. Paul Schafer pressed a button on a small, handheld device, and started to shake. The tremors were subtle at first, but within seconds his hands were shaking uncontrollably. When he picked up a plastic cup, the doctors sitting with him were grateful it was empty. When they handed him a pen to write his name, the scrawl couldn’t even be recognized as letters, let alone anything intelligible. 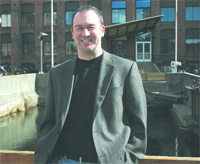 That was his life before his recent brain surgery, one of the first of its kind in the region. But when he pressed that button again — not without difficulty — the shaking stopped, and he was able, once again, to perform those simple activities. The procedure is known as deep brain stimulation, and it helps people like Schafer — who suffers from a common neurological movement disorder called essential tremor — as well as patients with Parkinson’s disease, dystonia, and obsessive-compulsive disorder, a chance at a normal life. The tremors caused by such conditions can be debilitating. But DBS, performed successfully — as Baystate neurosurgeon Dr. Mohamad Khaled did for Schafer — is opening up a dramatic new door to quality of life for potentially millions of sufferers. The surgery — which involves drilling a small hole into the skull, under local sedation, and inserting electrical wires into the area of the brain where circuit errors are causing the tremors — may also hold potential in areas ranging from Alzheimer’s disease to severe depression, but those frontiers are still being studied. Go HERE for a list of Skilled Nursing/PT Facilities in Western Mass. The U.S. Food and Drug Administration approved the treatment for essential tremors and Parkinson’s in 1997, and it’s now recommended for patients with severe symptoms that don’t respond to medication anymore, or when the response isn’t sufficient, said Baystate neurologist Dr. Octavian Adam. Because the medications weren’t working anymore, the Schafers saw DBS as, well, a no-brainer. According to the National Parkinson Foundation, deep brain stimulation has proven to be an effective treatment for that disease’s symptoms, such as tremor, rigidity, stiffness, slowed movement, and walking problems, as well as similar symptoms present in essential tremor. DBS does not damage healthy brain tissue by destroying nerve cells, the foundation noted. Instead, it uses a surgically implanted, battery-operated medical device called a neurostimulator to deliver electrical stimulation to targeted areas in the brain that control movement, blocking the abnormal nerve signals that cause tremors. 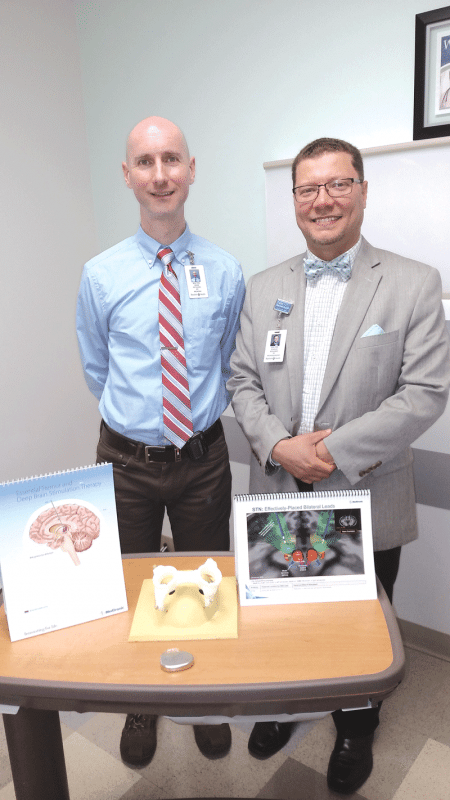 Dr. Octavian Adam, left, and Dr. Mohamad Khaled say not everyone with tremors is a candidate for DBS, but those who are typically find the results dramatic. The DBS system consists of three components: the ‘lead,’ an electrode — a thin, insulated wire — inserted through a small opening in the skull and implanted in the brain; another insulated wire passed under the skin of the head, neck, and shoulder, connecting the lead to the neurostimulator; and the neurostimulator itself, a sort of battery pack implanted under the skin, usually near the collarbone. In the first phase of the procedure — called phase zero, because it doesn’t involve surgery — the neurosurgeon uses MRI or CT scanning to identify the area of the brain where the electrical nerve signals generate the tremors. Phase one, as the next step is known, involves implanting the electrodes in the brain while the patient is under sedation. When the patient wakes up, Khaled asks him to point a laser at a target on the wall. As the doctor adjusts the electrical wires to target the appropriate circuit in the brain, the patient’s shaking hand slowly begins to stop shaking so that the laser is directly pointed in one location. That’s when Khaled knows he’s found the ‘sweet spot’ for the electrodes, and the patient suddenly is nearly cured of the tremors. After a few weeks of healing, a second surgical procedure is completed to make the changes permanent. The wires are attached to a device implanted in the chest, which is programmed to send electrical impulses to the brain, which block the signals causing the tremors. That said, only about 10% of patients with essential tremor are good candidates, and 20% of those with Parkinson’s, though the calculation with Parkinson’s is a bit more complex, requiring at least some positive response to medications and a lack of other conditions, such as dementia, cognitive issues, and severe depression. About 100,000 patients worldwide have undergone DBS since 1997. Previously, the closest hospitals in the Northeast that offered it are in Boston to the east, Albany, N.Y. to the west, Burlington, Vt. to the north, and New Haven, Conn. to the south. “So we had a big hole in the middle,” Khaled said. Schafer was also, naturally, curious about how long DBS would prove effective. Khaled and Adam explained that early response is always the strongest, and over time — perhaps a decade or more — some of the effect may start wearing off. But the device settings can be fine-tuned to provide better coverage and more control. Paul Schafer speaks to the media about how DBS has allowed him to perform routine tasks that had become impossible. Schafer knew he was one of those success stories when, right after the electrode began delivering signals to his brain, doctors handed him a flashlight, which he slowly — and accurately — lifted up to his mouth like a glass. He shuts the system down to sleep — “when I turn it off, it’s a whole different world,” he noted — but restarts it in the morning and feels the tremors subside. He compares the feeling, when the neurostimulator switches on, to the tingle of a Novocaine shot, only throughout his whole body. Today, he and Kathie say they understood both the potential and the risks — and there was really never any question. Paul, now able to live a relatively normal life, plans to start a support group for people with essential tremor. “There are a lot of people out there with what I have,” he said, knowing that he can both share his experiences with those who might qualify for the surgery and at least bring together those who don’t. But he hopes more people fall into the former category than the latter. Kathie agrees. “He has a wonderful sense of humor, and he’s always been able to accept what happened with him and take it humorously and have everyone relax around him. But I knew it bothered him,” she said.